RICHARD Rive, together with Harry Hendricks, played a pivotal role in providing athletics to thousands of disenfranchised high school pupils under the umbrella of the Western Province Senior Schools Sports Union (WPSSSU). Hendricks, the older of the two, and Rive were athletes in the 1940’s. 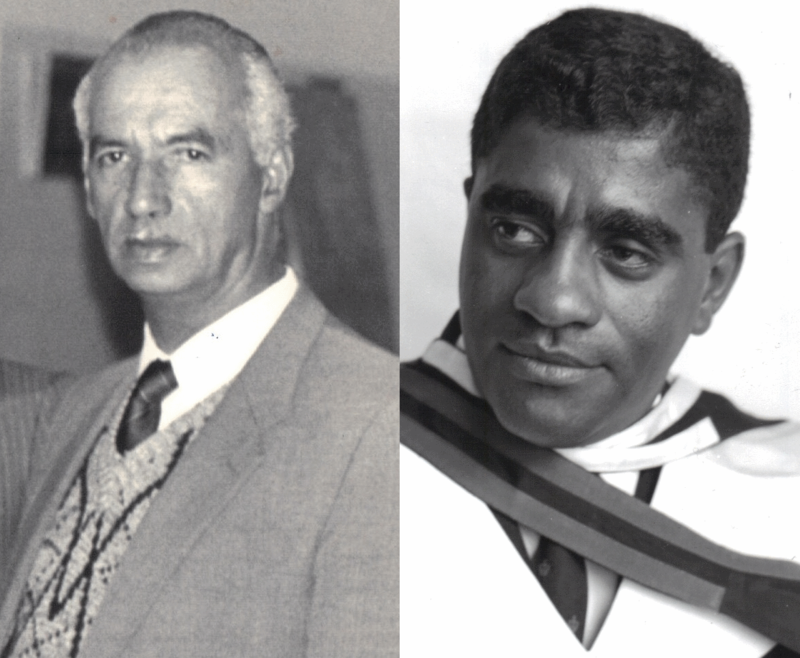 Harry Hendricks and Richard Rive were the brains behind high schools athletics. First, Rive roped in Cecil Blows to be the convener of the highly successful track and field athletics of the WPSSSU culminating in the first Champion of Champions athletics meeting in 1964. Next he and George van der Ross roped in Eric Hector to convene the WPSSSU cross country events in 1970, with the first race being held at the Ottery School of Industry. “Dr Rive and Van der Ross said that I should take charge of this code,” said Hector who did the job to the “best of my [his] ability”. Hector then proceeded to invite between 30-35 schools of the WPSSSU to the cross country events. “In those days, at many high schools, the principals insisted that the pupils must stay after school and take part in sport or a code offered by senior schools. 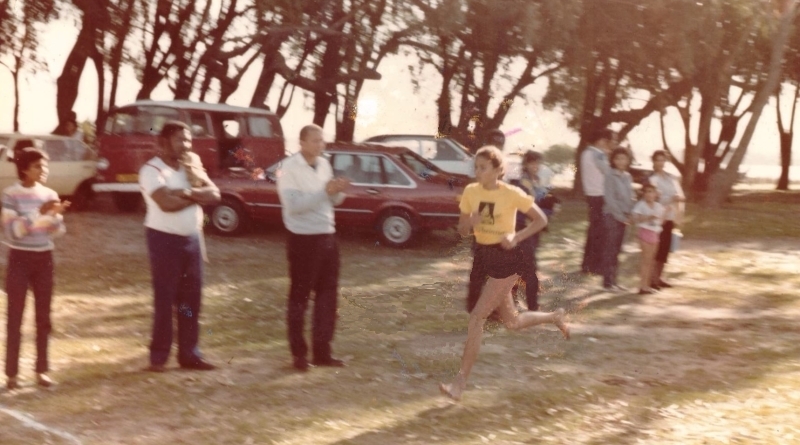 Roslyn Meyer (Williams) running in her SASSSA colours at Zeekoevlei. “Cross country was a simple code because all you needed was a car, and you put four students into the car and drove them to the venue,” explained Hector, now aged 77. Four athletes made up the team competition. There was one age group and the girls initially ran 2,5km and the boys 5km. The first race was at Ottery School of Industry as the venue could accommodate most of the schools in the surrounding areas. Hector had to use the true metre wheel and measure out the course on foot because that was the only way to measure out the course accurately. 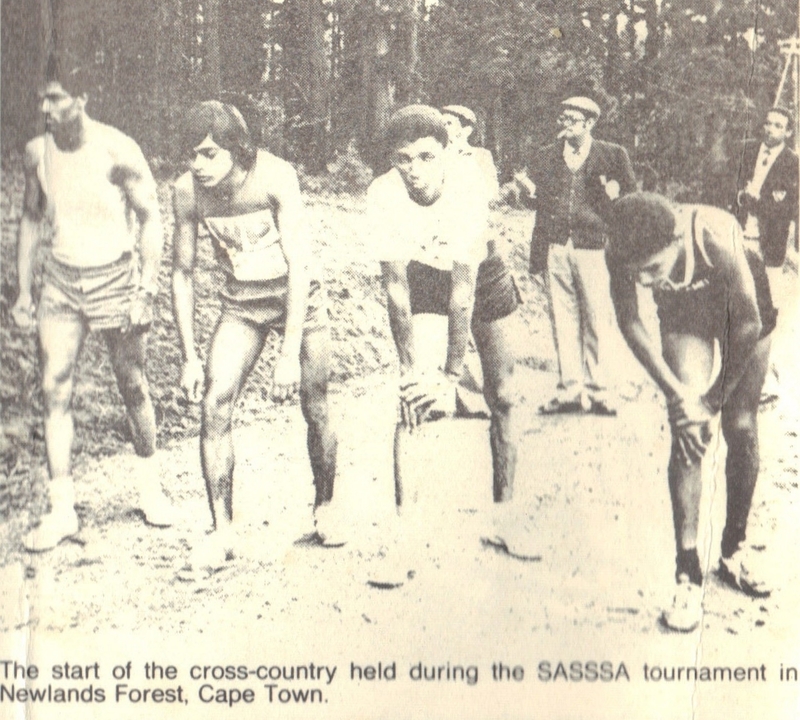 The start of the SASSSA boys cross country race at Newlands in 1976. He also organised competitions in Ocean View, then at Zeekoevlei and Newlands Forest. “We used those four venues mainly,” he said, the Ottery School of Industry being the fourth venue. “But you know the students could not understand how the team positions – the first to 10th positions – were determined. We had to explain it to them,” said Hector. 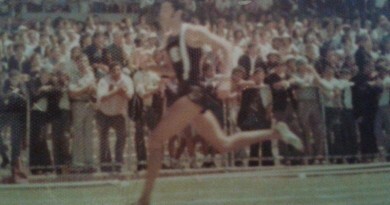 Many of the top middle and long distance athletes like Roslyn Meyer, Victor Snyders and Freddie Williams used this competition to improve their track performances. Richard Rive and Harry Hendricks, right, officiate at the first SASSSA cross-country meeting involving Boland and WPSSSU at Newlands Forest in 1976. The WP athlete is Derrick van Dieman. “Snyders works in the navy. I used to see him often. Cross country was a good side line event for the long distance track runners. Cross country was like a form of relaxation, and it was a form of exercise for them. Even some of the more plump girls participated. They didn’t mind, they participated and were more than chuffed that they finished the race,” recalls Hector. The sport grew rapidly in the early 1970’s so much so that the WPSSSU had to consider dividing the runners into age groups. “I wasn’t in favour of it because you had to deal with birth certificates. “I already had 200 metal plates which I made, and had used to hand out the positions of the runners. “We couldn’t use the age group system because the cross country event was after school and time was a factor. Some schools had to travel from deep in the northern suburbs to the cross country races in the southern suburbs and vice versa and time was of the essence. You must remember the cross country events were run during the winter months. We had to take all these factors into account, so we just kept it down to a boys and girls team,” explained Hector. Jowaine Lategan (Parrott), a former SASSSA cross country captain. This did not prevent any runner from getting into the WPSSSU team. If athletes were as young as 15 or 16 years and they beat the other runners, nothing prevented them from getting their provincial colours. “So as I say, the cross country code stayed like that, it was just an open competition for boys and girls,” he emphasised. As the code grew bigger and stronger, there was a need to increase the distance as several of the athletes also competed in club competitions under the Western Province Amateur Athletics Union (WPAAU). “I then decided to increase the distance from 2,5km for girls to 5km and for the boys from 5km to 10km as after [completing] school, at club level, these were the distances the runners had to cover. “The increase in distance had put the school athletes in good stead for competition at club level,” explained Hector. Hector remembers school athletes who had competed in club competitions already. 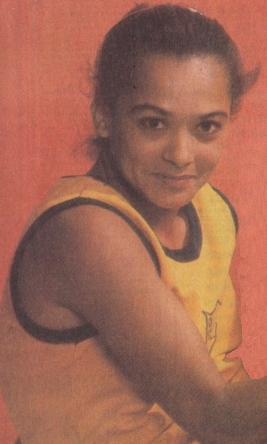 “You had athletes competing in club competitions already, like this girl Jowaine Lategan (Parrott). “She came all the way from Luckhoff in Stellenbosch and ran herself into the WPSSSU and SASSSA teams,” says Hector. Jowa Abrahams, Roland Palm and K. Knoesen. Knoesen was from Coca-Cola, the sponsors. At the time the clubs had competition at Gunners Circle, Wetton, Zeekoevlei and Newlands Forest. 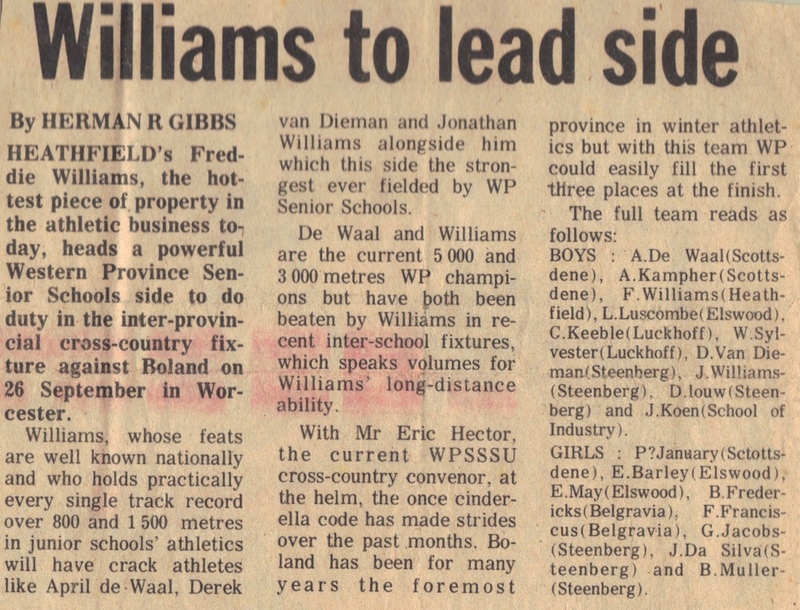 With so much interest in the sport, the first cross country meeting for schools, at a provincial level, took place at Newlands Forest in 1976. “The first senior schools cross country championship, with some of the provinces, was held in 1976 when Roland Palm, the president of SASSSA, and Jowa Abrahams, the secretary, were at the helm of the organisation,” said Hector. The SASSSA event was held as far as Worcester, together with football and rugby. Rugby was played in Worcester. Football was played under lights at the Athlone Stadium, with Peter Fisher captaining the under 19 side. 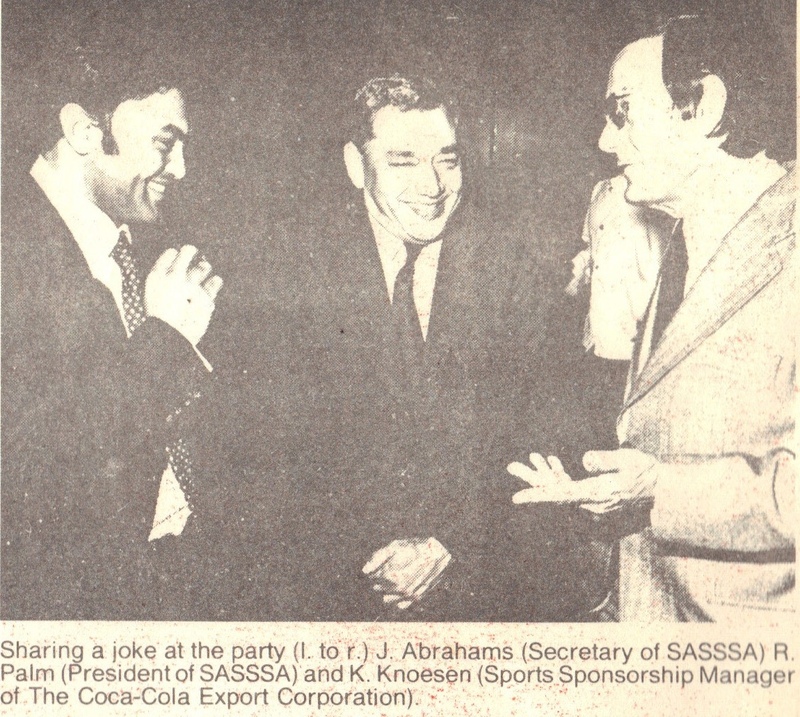 A decent programme, sponsored by Coca-Cola, confirms that these events, in fact, took place. 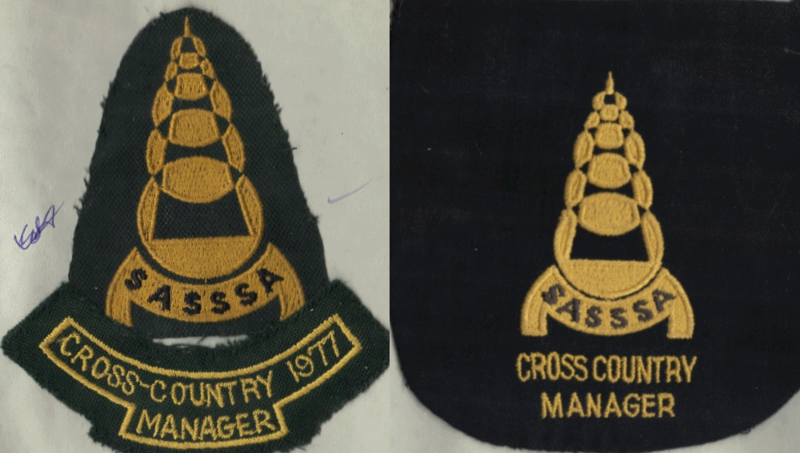 The green and gold SASSSA badge off 1977 had been changed to black and gold in 1978. 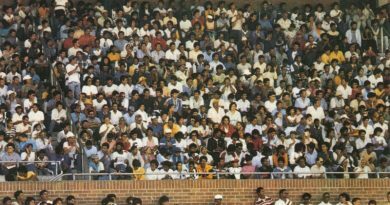 However, the first full-blown South African Senior Schools Sports Association (SASSSA) cross country championship, involving all the provinces, was held in Durban in 1977. “The first big SASSSA cross country championships were held in Stanger in Durban in 1977, the year I was appointed the manager of the SASSSA cross country team. In 1978, I was appointed as the national convener of cross country by SASSSA,” says Hector. The people who had assisted him with organising of cross country events were the late Edgar Bastian and Peter Loxton. He held the post until 1984 when he resigned from teaching. Loxton of Scottsdene, succeeded Hector as the new WPSSSU convenor. 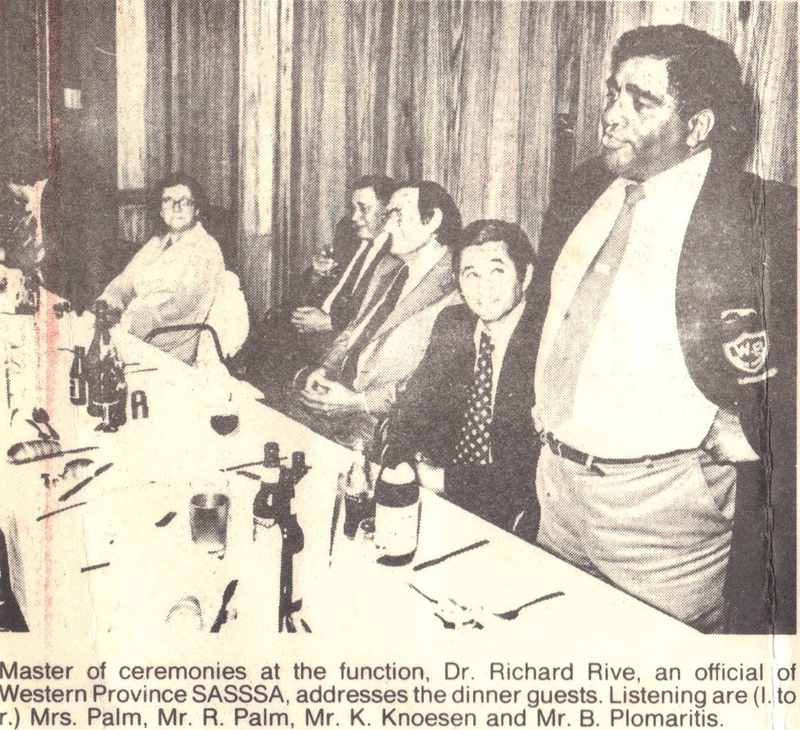 Dr Richard Rive addresses the dinner guests at the conclusion of the SASSSA tournament in 1976. 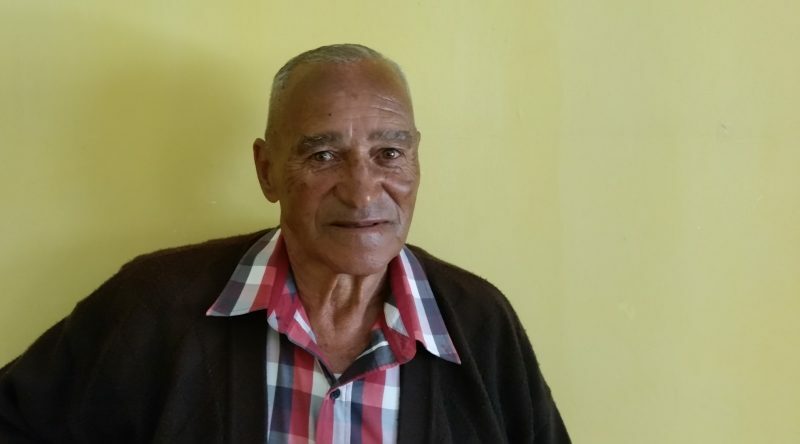 Hector is a former WP athlete who attended South Peninsula High during the 1950’s. 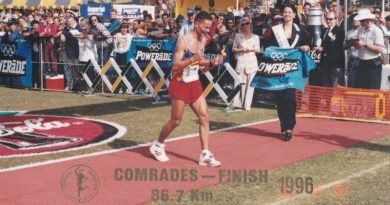 He was coached by English schoolteacher Richard Rive while in standard 7 (grade 9) and a member of the Aerials Athletics Club in District Six. He remembers athletes of the calibre of Nicky January, G de Bruyn, George Capito, Willie Londt, A Dames, Willie Smith, Peter Forbes, Gerald Naude, Richard Rive, C Macaskell, Gerald Hendricks, Herby Abrahams, Gus Jacobs, H de Wet and the ladies Rosie Schaffers and Margaret Groenewald. His first teaching post, as a young physical education teacher, was at Arsenal Road Secondary School in Simonstown in 1961. He was a delegate to the WPSSSU meetings in 1961 and in 1962 he was the coach to the middle and long distance athletes of the WPSSSU team that had travelled to Johannesburg. At the time, L Janari the chairman of WPSSSU, and J de Bruyn, the secretary, represented WPSSSU at the SASSSA meeting in Johannesburg. Freddie Williams of Heathfield High School was the captain of the WPSSSU cross country team in 1979. The coaching staff of the 1962 WP team was Rive (sprinters), Hector (middle and long distance), Andrew October (field events), D van Niekerk (high jump and long jump) and the chaperone was Miss Pat Cecil (later Mrs Van Voore). He remembers the competency of Cecil Blows and Freddy Britten who had organised senior schools athletics during those early days with little or no resources. 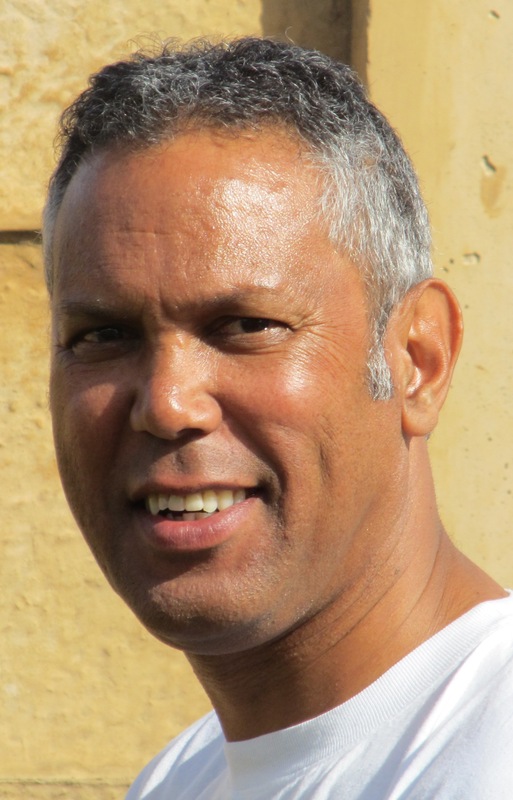 Hector, who also played cricket, expressed an opinion on Sacos, the sparse or non-participation of black athletes, his late friend Eric Majola and the late Hassan Howa. “One of the first black girls to be picked in the WPSSSU cross country team was Cynthia Khumalo and she was from Crestway High School. You could see she had athletic ability, you could see her talent,” recalls Hector. But these are razor-sharp stories for another day. Donovan Wright reached out, survived and won ! Something’s wrong: In 1970, George v d Ross was a first-year student. It’s hardly likely that a first-year Hewat student would have a say in the running of WPSSSU affairs? On another scale, a Hewat student, in consultation with two WPAAU bigwigs, initiated the first SAAAB Prestige Track and Field Meeting, involving the cream of the SA clubs, SA colleges and the SA high schools in 1985. Nothing new here, or surprising!